Nero is making a good recovery from illness and is reunited with his sister Nicki and brother Nico and Dutch herder Henry is released from the puppy program. From left to right is Nero with puppy walkers Lyndsay, Henry and Chris, Nicki with puppy walker Margaret, and Nico with puppy walkers Rod and Karen. Those of you who regularly follow our blog will know that I collected Nero, Nicki and Nico from Kazzardsway German shepherds in Manchester 7 weeks ago when they were 8 weeks old. 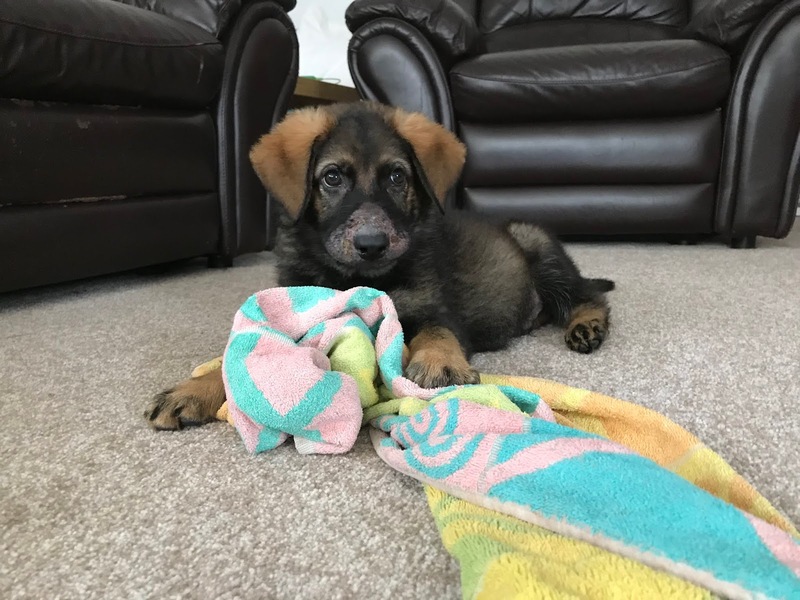 At that time Nero was recovering from a potentially devastating skin disease called Juvenile Cellulitis more commonly known as Puppy strangles. The cause is unknown but it only occurs in young pups between 3 weeks and 4 months of age. Symptoms are an acutely swollen face- especially the eyelids, lips and muzzle, marked pustular and oozing skin disease, crusted lesions, tender skin, lethargy, loss of appetite, fever and a compromised immune system. Fortunately breeder Bernard referred him to the vets very quickly and they immediately correctly diagnosed and started his treatment. Sadly in a lot of cases this isn’t done quickly enough which can result in serious consequences. 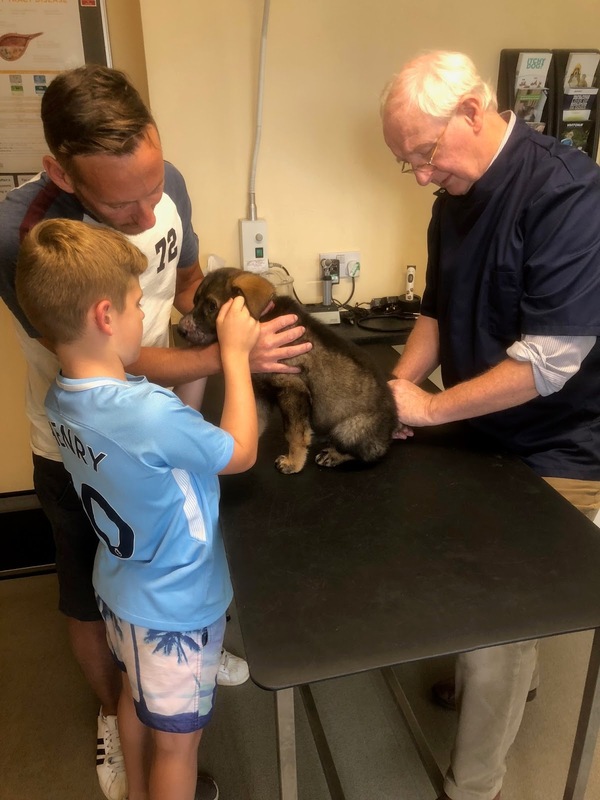 Puppy walker Chris ably supported by his son Henry have been closely monitoring Nero and diligently giving him his medication and bathing sessions. Chris wasn’t completely happy with his progress and got him to our vet Clive of Beaumont veterinary centre in Pinhoe. It was a good call by Chris because Clive decided that he had been taken off antibiotics too soon and needed further steroid intervention. 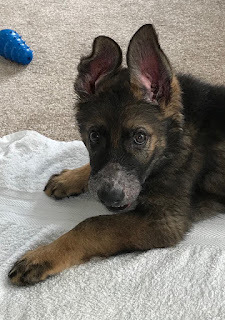 Because Nero’s immune system had been compromised he has had to delay his vaccinations and has had to avoid contact with other dogs. Henry and his pals have made sure he hasn’t got bored at home. Because Nero couldn’t go out and missed his first training session Chris made sure he didn’t fall behind with plenty of training at home. 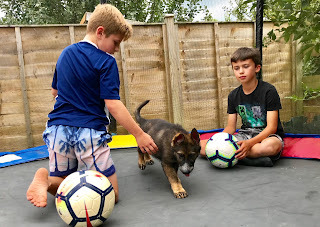 Nico and Nicki had their first training session 2 weeks ago but I purposely withheld doing a blog or tweeting photo’s because I didn’t want Nero’s puppy walkers to feel left out. I don’t think Nero’s was too bothered as he was having a good time at home anyway. They finally all got together for a training session last Sunday. It was great to see the huge improvement in Nero’s condition to what it was before. 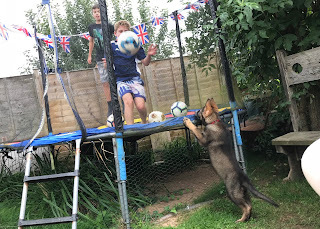 We started with an introduction to the low ramps for Nero before increasing the level of difficulty slightly for all 3 pups. You would never know that Nero had missed the previous session and with his best mate Henry they made light work of the larger ramps. We then did some work on our sits, downs, sit stay, down stay, recalls and an introduction to walking to heel. My first impression of the 3 pups is that they are all very confident and have a focus and willingness to learn which bodes very well as they set out on their journey to be Police dogs. I was also very impressed with the work the puppy walkers have already done with their pups with the focus exercises. 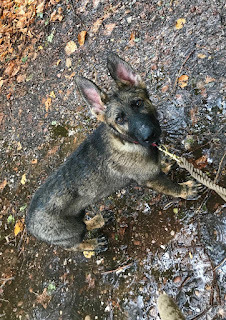 For all 3 puppy walkers to already have a sit stay and a down stay with their pups at such a young age is testament to their dedication and enthusiasm. We had a good discussion about the importance of having a fast and instant recall to handler and how to achieve it. One day this exercise could be a life saver and there is no doubt in my mind that a fast and happy recall nearly always signifies an excellent working relationship between handler and dog. I was very impressed with the puppy walkers and their pups and look forward to introducing them to the tracking exercise on our next training day. Henry is pictured here with puppy walkers Jill and Terry on one of the many training days that they attended with Henry. Henry was our first Dutch herder and was obtained from Lorokmor working dogs in Shropshire at 8 weeks of age. Terry and Jill are very experienced puppy walkers and Henry was the 12th puppy that they have puppy walked. They attended all of the fortnightly training days with Henry. On his puppy assessment at 8 weeks Henry assessed as a playful confident pup. But he has shown a nervousness and lack of confidence in environmental situations throughout the 10 months that he has been with his puppy walkers. Like most working Dutch herders he has a natural aptitude for work and a particularly strong fighting and biting drive. Police dog trainers use this drive to train our general purpose Police dogs to deal with conflict resolution situations such as defending himself and his handler against attack and detaining fleeing criminals. Here he is showing early promise in his tracking. 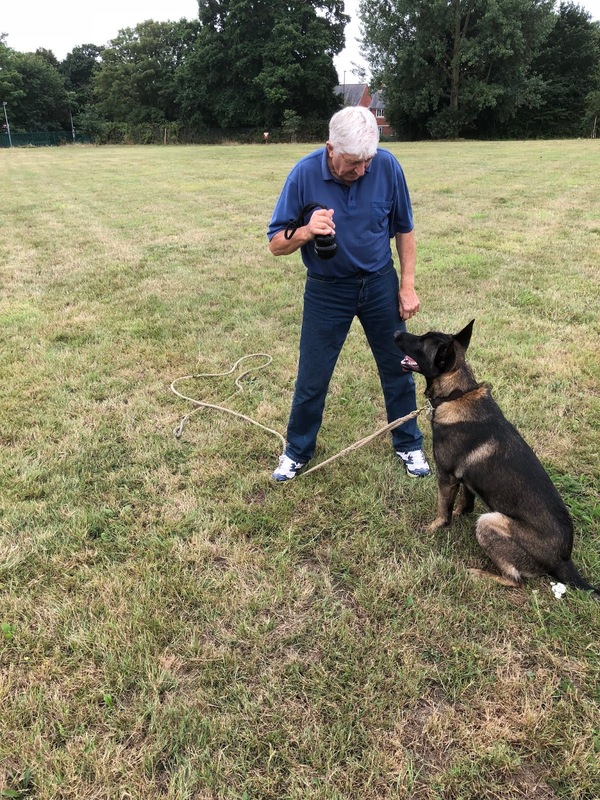 Because Dutch herder’s are renowned for their strong fight drive and possession we made sure that we introduced control exercises from the beginning and conditioned him to always release his toy on command from day 1. 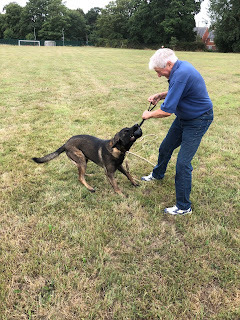 Here is puppy walker Terry demonstrating tug of war with Henry and then getting him to leave on command. Here is Jill working on his down stay. 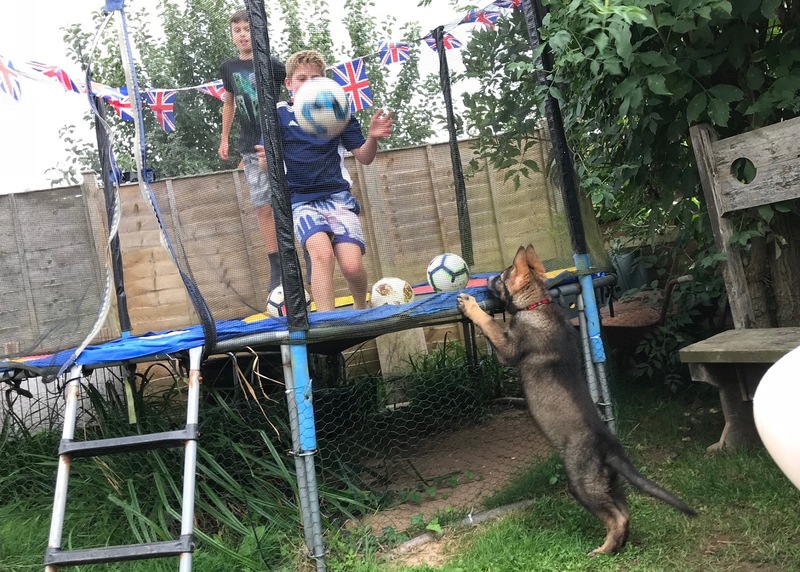 To be a successful operational Police dog it is very important that our dogs are very confident in all environmental situations and are able to cope with stress. Dogs who are not environmentally confident or have nerve issues can be a liability when working under stress in real life situations. Often they panic and sometimes will bite Police officers or innocent members of the public who get to close to them during incidents. Our puppy walkers spend a lot of their time socialising and developing their environmental experiences and confidence. 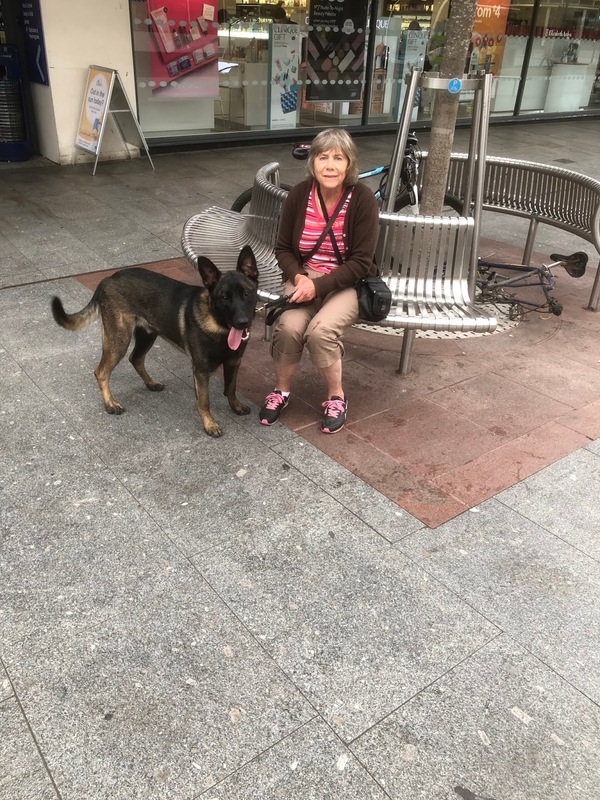 Jill can be seen every Saturday morning taking all of her pups over the years into Exeter city centre. 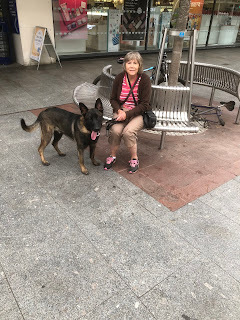 Jill tells me that out of all the pups that she has walked Henry has been the most nervous and most easily stressed environmentally and meeting new situations. In an area he is familiar with such as his home or where he is regularly walked he is fine and would probably make a very good working dog once he matures. But his very strong working drives and determination and possessiveness mean that he is not suitable for a pet home. In his last week he stayed with me at our house and I did see for myself how he could become stressed in new situations. I’m disappointed it didn’t work for us because he was certainly a character and my first Herder. 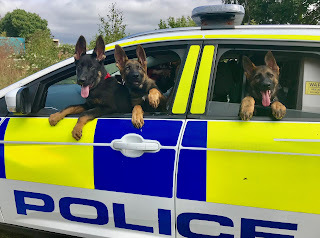 I would try again if the right pup became available but I would probably raise the pup myself next time as they are definitely a dog to be raised with an experienced handler. I have therefore returned Henry to his breeder Ian of Lorokmor working dogs because I know he will assess him and find him the right home. He tells me that he is very impressed with Henry so far and will let me know how he gets on. I would like to thank Terry and Jill for all of their hard work and all the time that they have spent trying to give Henry every chance to become a Police dog. 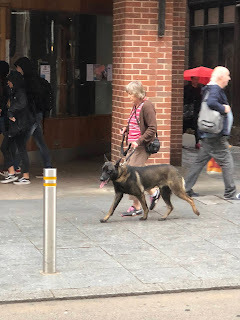 Over the past month I have been assessing all of the dogs in Exeter city centre to see how they coped with the crowds, vehicles, shops, shiny floors, escalators, lifts, meeting other dogs and all the rest of the environmental situations encountered in a busy city centre. Here is Lola demonstrating confidence, calmness and good temperament during her session. In my next blog I will let you know how they all got on.